It is impossible to work with parrots for any length of time without the trade in wild birds raising its ugly head. Whether you are in the deepest forest of the Amazon, the bleakest stretch of Australian outback, or a pet shop in London or Los Angeles, the long and treacherous tentacles of the trade are there in force. It's no surprise then, that upon founding the World Parrot Trust back in 1989, Mike Reynolds was quick to plead in the very first issue of PsittaScene that we "please stop the parrot holocaust." He noted that one immediate action which would help the parrot's prospects for survival would be to "place a ban on the mass shipment of wild-caught parrots from one country to another." With trade threatening parrot species around the globe and causing untold suffering for the millions of birds involved, the wild bird trade represented the perfect target for the Trust's aims of parrot conservation and welfare. Since that time, we have learned a great deal more about the trade, about how destructive these harvests can be to wild populations and how few birds actually survive from trapping to the point of sale. We've also learned about the diseases they bring with them - often picked up along the way - which have led to dangerous and costly outbreaks in the importing countries. On the positive side, we've learned about what kinds of solutions to these problems work, and which ones do not. In the early 1990's, two parallel efforts were afoot on either side of the Atlantic. In Europe, three organisations - the RSPB, RSPCA, and EIA - worked together to urge the end of wild bird imports to Europe. They achieved considerable success with commercial airlines, many of which agreed to stop carrying commercial shipments of live birds. They also inspired an impressive Resolution by the European Parliament calling for the European Commission to end imports of wild birds. In the end, however, traders largely found a way around the airline bans and the Commission never responded with concrete action. Campaigners in the USA - perhaps due to sheer good fortune - achieved a more lasting success. Building on a new bird trade law in the state of New York, campaigners urged the federal government to follow suit and prohibit the importation of most wild caught birds - primarily parrots. In 1992 the Wild Bird Conservation Act was passed by a unanimous vote of both Houses of Congress (everyone loves parrots! 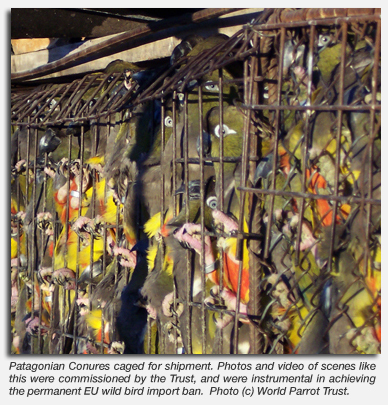 ), and effectively eliminated the USA as the largest single importer of wild parrots. In the aftermath of this Act, markets shifted dramatically, aviculture in the USA thrived, and disease incidence in captive birds plummeted. As it turns out, researchers working on conservation projects throughout the New World were also keeping track of how often the nesting pairs they were studying had their eggs or chicks poached. Separately, these data were of little interest, but put together, they turned out to be extraordinarily powerful. Drs. 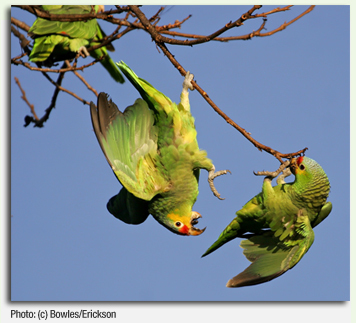 Catherine Toft (UC Davis) and Timothy Wright (then at UC San Diego) successfully urged their colleagues from all over the Western Hemisphere to collaborate on one group study of parrot poaching. Their publication - with 26 authors! - had a number of truly unique consequences. They showed that poaching was having devastating impacts on supposedly protected parrot species, with over half of the nests being poached in many cases. They also showed that poaching levels were cut by more than half after the USA stopped importing birds. Take home message: bans work. It's rare when a small organisation gets its teeth around an enormous problem, and rarer still that it can bring that challenge to a successful outcome. It is against this backdrop of events, successes, missed opportunities and grave concerns that the World Parrot Trust launched a campaign in late 2000 to halt the imports of wild birds into Europe. We knew it was risky, and we really didn't know if we would ever reach our goal - even up until the last minute - but we also knew that we couldn't in good conscience sit back and do nothing, not if we truly cared about parrot conservation and welfare.